Are things about to TURN AROUND for the Knickerbockers? Things were looking BLEAK for the Knicks a week ago but after WINNING two games in a row to CLOSE out the week, they are headed in the right direction. The Knicks CAPITALIZED on an EASY schedule last week to get a ROAD win to close out the West Coast trip which was DISASTROUS for them. The Knicks only won TWO games during that ROAD trip which is not IDEAL for a Playoff team. This week the Knicks have TWO games at HOME that they should WIN and TWO games on the ROAD that they will lose, so they are going to remain MEDIOCRE. The Knicks LOST in a blow out game to the Nuggets in Denver last Thursday which was NOT surprising. The Knicks are TERRIBLE on the ROAD and that needs to CHANGE in order for them to get to the Postseason. The Knicks were able to get a ROAD win on Friday Night in Phoenix against the Suns which was a POSITIVE for the team. They have STRUGGLED on the ROAD and in the SECOND game of Back to Backs, so a WIN on Friday definitely gave them so MOMENTUM. 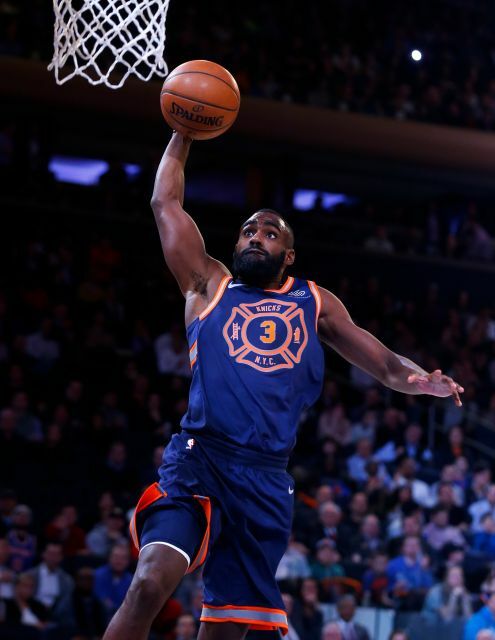 The Knicks build even MORE momentum by BLOWING OUT the Brooklyn Nets at HOME last night and it was the DEBUT of the “City” jerseys which honors the Fire Department of New York. The Knicks have CAPITALIZED on the Nets by beating the Nets FOUR times this season. The Knicks have some MOMENTUM going into tonight against the Celtics in Boston. The Knicks usually STRUGGLE on the ROAD and in Back to Backs so they will probably LOSE tonight. The Celtics are one of the ELITE teams in the NBA, so the Knicks are NO WAY near them and I am expecting a BLOW OUT. The Knicks then travel to Milwaukee to face the Bucks on Friday night which is another game that I expect them to LOSE. The Bucks are in the Top Half of the Eastern Conference who are going to find a way to WIN the game at HOME. The Knicks schedule EASES up for the rest of the week when they HOST the Atlanta Hawks on Sunday Afternoon which should be a WIN for them. The Knicks NEED to win this game because the Hawks are WORST than the Knicks so they have to WIN this game to keep up the pace in the Eastern Conference. They END the week against the Bucks at HOME on Tuesday Night which is another game they should WIN. Though the Bucks might WIN this match up on their HOME court, the Knicks NEED to win this game at Madison Square Garden. This week for the Knicks we saw the emergence of Kristaps Porzingis who did not MISS any games this week and was pretty good. The real question around him is if he can keep this up this week against some TOUGH opponents which is NOT something that he has done. The trade deadline is APPROACHING and while other teams are making moves to IMPROVE their rosters, the Knicks have stayed PUT thus far and it will be INTERESTING to see what they do as the Trade Deadlines comes closer. The Knicks are in MEDIOCRITY right now so will they SELL their minimal assets or try to BUY and make the Playoffs. The Knicks are NOT good enough for to CONTEND so they would be DUMB to go hard on the deadline and they do not have enough good ASSETS to get GOOD returns so the Knicks will remain MEDIOCRE for Eternity and PISS OFF their fan base.